Online ordering menu for Sweet Malik's. 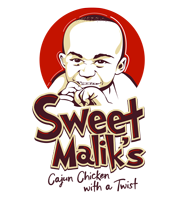 Sweet Malik’s offers authentic Cajun fare that fuses savory Louisiana spices with a sweet twist. All of our menu items contain some form of sugar or honey, which is then fused with our secret blend of fresh Louisiana spices. Try our Po'Boys, strips, or wings! We're located south of Lake Viridian at the corner of Brown Blvd and Collins Street. Order online for carryout or delivery!